A boxer who could jab like a mantis shrimp could win every match with a single blow. Mantis shrimp attacks a marine snail with its knoblike dactyl. 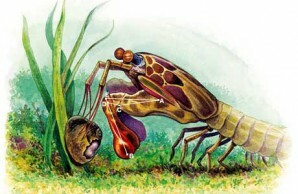 A saddle-shaped "spring" made of chitin (above and to the right of point C and above the flexed muscle AE) enables the shrimp to deliver a blow much more rapidly than its muscles could do alone. A three-inch-wide reef crab, straying near the entrance of a mantis shrimp's burrow, has made its last mistake. The mantis shrimp comes boiling out of its home, its colorful, paddle-like appendages signaling hostile intent. Two arms, adapted for hunting, are held folded, “chest” high, against its thorax. The mantis descends on the crab rapidly. After two movements—so fast as to be nearly imperceptible—accompanied by quite audible pops, there is a gaping hole in the thick shell of the crab. The mantis, itself six inches long, settles over the crustacean and with several more blows opens up the soft body of its prey. The power of the strike is such that even a casual observer would sit up and take notice. How can such a small animal generate so much force in so little time? Biomechanists have recently discovered the surprising secret of the mantis shrimp: to destroy both prey and rivals, the animal relies on a clever spring and linkage mechanism that makes it the fastest “puncher” in the animal world. Mantis shrimp, which comprise an order of crustaceans also known as stomatopods, inhabit near-shore waters all over the world. From the biomechanist's point of view there are two main kinds: the spearers, whose hunting appendages are tipped with spikes for impaling fish, and the smashers, whose appendages are rounded into a knoblike dactyl that can shatter thick snail shells. Smashers use their fearsome club to kill prey items and other stomatopods, and, in captivity, to break aquarium glass. Recently Sheila N. Patek, Wyatt L. Korff, and Roy L. Caldwell, all zoologists at the University of California, Berkeley, set out to quantify just how fast a mantis shrimp can strike. Recording the motion with high-speed video cameras, they found the dactyl moves at more than fifty miles an hour. The peak acceleration is more than 10,400 times the acceleration of gravity. The fist of a boxer able to jab with such acceleration throughout his punch would be traveling at escape velocity from the Earth after just eleven-hundredths of a second! Patek found that the mantis shrimp delivers its smashing blow with a hundred times more power than its own “arm” muscles can generate. To focus such explosive power the mantis shrimp cheats by slowly storing muscular energy with a spring and catch mechanism, then suddenly releasing the energy. Catch mechanisms are responsible for the ability of some predatory fishes to rapidly open their mouths. But the spring of the mantis shrimp, a saddle-shaped piece of chitin that stores the muscular energy, is unique. The striking muscles squash together the ends of the saddle, causing it to rise up. When the catch is tripped, the saddle snaps back to its original shape, and the dactyl is propelled forward with devastating effect. 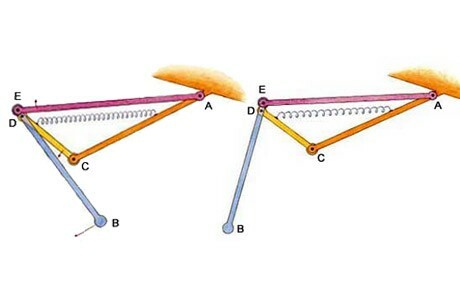 The force of the spring is transmitted by what is essentially a long lever that connects the dactyl to the rest of the shrimp's arm; far from the fulcrum, the dactyl moves much faster than the spring does [see diagrams below]. Schematic diagram of the striking mechanism of the mantis shrimp comprises three bars of fixed length (one of which, bar AC, is stationary), a contracted muscle (AE) that acts like a fixed-length bar, and a spring, linked together as shown. (Note, however, that in reality the spring lies above the muscle.) 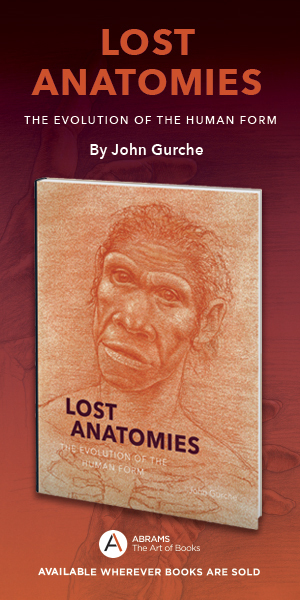 The labeled points A through E in the diagrams correspond to the points marked on the drawing of the shrimp [see illustration at top of page]. In the cocked phase (above left) the spring is compressed. When the mechanism is released, the spring pushes against bar CD, causing point D to rotate counterclockwise around point C. Because of the rigidity of the bars, that rotation forces a slight clockwise rotation of bar AE about point A. The small, simultaneous movements of points D and E, which are both locked onto bar BE, translate into a large movement of point B—the business end of the mantis shrimp's striking mechanism—propelling it toward the shrimp's target with devastating effect (above right). There is more at work here than just the action of saddle springs, though. When the dactyl strikes a target, distinctive bubbles form and collapse, a telltale sign that some of the devastation is caused by a phenomenon known as cavitation. Cavitation is the bane of the drive propellers on powerboats. When an object moves so fast through water that the pressure in its wake is lower than the vapor pressure of water, the water near the object, in effect, boils, and minuscule bubbles of water vapor form around the moving object. When the surrounding water returns to its normal, higher pressure, the bubbles collapse with such force that they cause pitting on surfaces as hard as stainless steel. Cavitation is explained by Laplace's law, which will be empirically familiar to anyone who has ever blown up a balloon. Laplace's law states that the pressure inside a bubble is proportional to the tension in the wall of the bubble divided by the bubble's radius. Thus the smaller the radius, the higher the vapor pressure inside. Remember how hard it is to get that first puff of air into the balloon? The radius is small and so the pressure must be high to swell the balloon. As the balloon inflates, though, the pressure needed to expand it further decreases dramatically. The cavitation bubbles formed during the strike of the dactyl range in size from a quarter of an inch to just a few hundredths of an inch in radius, and the pressure inside can be thousands of pounds per square inch. As the bubbles wander from the low-pressure region where they formed, higher pressures compress them; their decreasing volume drives the pressure inside the bubble, as well as the temperature of the water vapor, higher still. Such hot, high-pressure water can cause a lot of damage. The bubbles form between the mantis shrimp's dactyl and the shell of its prey, so cavitation may play an important role in destroying hard targets. It also poses a problem for the mantis shrimp. The dactyl itself becomes pitted and scuffed, even on parts of its surface unlikely to have hit the prey directly. The cavitation bubbles may be causing the damage. Whatever the source of the damage, the stomatopod compensates for it by shedding its hard outer skeleton periodically. Vulnerable but still feisty, the mantis shrimp continues to rush from its burrow when provoked, even though it's not much of a threat. 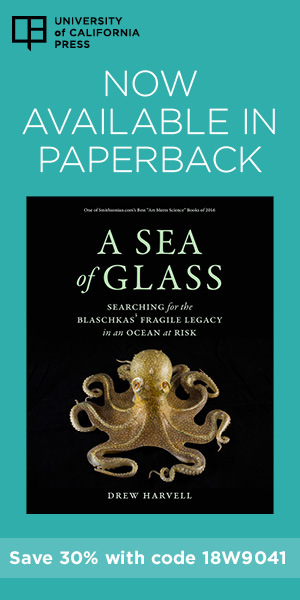 But as the exoskeleton hardens, the animal once more becomes the peerless puncher of the sea, and probably the miniweight champion of the world.